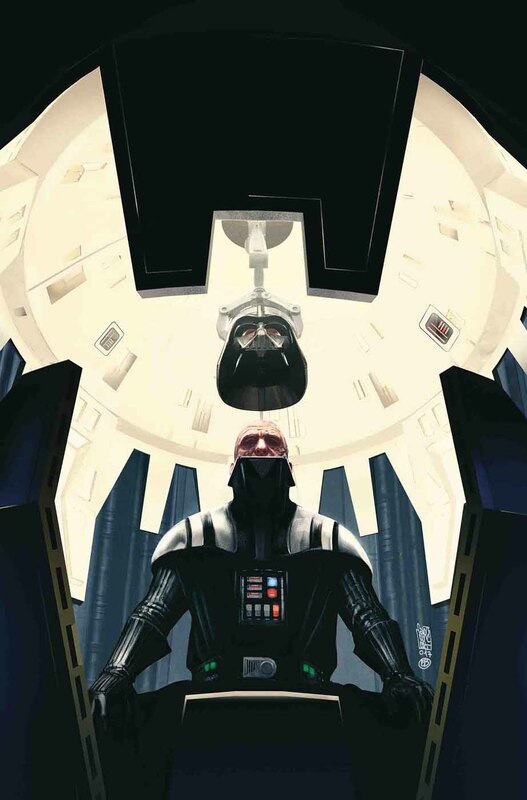 Darth Vader #13 ends with a dirty hook, but it does set up some intrigue with the whole impending invasion of Mon Cala. With Tarkin, Vader and the Inquisitors involves, it’s quite the offensive force. Yet the Mon Cala have their own all star team with King Lee-Char, Ackbar, Raddus and a mysterious Jedi. This arc definitely has some potential. The issue opens with Darth Vader dreaming or meditating about Obi-Wan. He’s reliving the battle on Mustafar, but this time he’s in his Vader armor and when Obi-Wan has the high ground, Vader remembers to use the dark side. The tables turn as he watches Obi-Wan burn in the lava. I’m not exactly sure what this part has to do with the greater story, but it’s kind of interesting. It’s also something we’ve seen before in the Vader comics. Regardless, Vader gets a new mission to head to Mon Cala. It appears the people who tried to take Vader’s life are being put on the back burner for this new mission. He heads to Mon Cala where Tarkin is already in orbit. Shortly after landing on the planet with some Inquisitors by his side, the Imperial ambassador’s shuttle blows up. Vader blames it on anti-Imperial forces on the planet, Tarkin takes it as a sign to attack, and the readers are left clueless as to what actually happened. Charles Soule does a few sneaky things in this issue. First off, he throws in Raddus, which is an easy way to satisfy everyone. Raddus is most definitely a crowd favorite, and we’ve have gotten much of him since Rogue One. Not that he’s got a huge part in this issue, but it’s a nice tease and it leaves everyone wanting more. He also puts Ackbar in this issue, along with Lee-Char, a nice bonus for Star Wars: The Clone Wars fans. Yet there’s some more subtle inclusions as well. For instance, the issue takes place in Dac City. Back in the day, the Dark Horse Star Wars comics were establishing Dac as an alternate name for Mon Cala. Then there’s the presence of Tarkin in this battle for Mon Cala while Ackbar is below on the surface. In the old Legends stories, Tarkin and Ackbar had some serious history. At one point Ackbar was Tarkin’s slave. So it will be interesting to see the two sides clash in this arc. But for all of that, it’s nothing compared to the hook the issue ends with. It’s kind of a low handed, cheap move, but it’s still really effective. It ends with a hooded, mysterious Jedi revealing that they know Vader’s true identity. So who could this be? Here’s the thing. Soule grabs for a lot of low hanging fruit that’s sure to please the audience. It masks the story that’s at play to the point that I can’t tell whether this is good or not. On one hand, it opens with this odd Obi-Wan scene. The series itself had everyone primed for Vader doing a witch hunt of Imperial officers to find this mysterious guy missing a couple fingers. But now all the sudden we’re on Mon Cala getting ready for a war. Palpatine wants to make an example out of them, though it’s not really stated why Mon Cala is such a prime candidate to be made an example of. Aside from the Jedi Palpatine is somehow able to sense. Then there’s Tarkin who is full prepared to capture Mon Cala by force, but also willing to let diplomacy and negotiations roll on first, and then turns a 180 and decides now is the time to attack. Here and there, there are flaws with the story. There are things that don’t quite add up or fit together. Yet there’s also these big crowd popping inclusions that make you forget about and overlook the flaws. In the end, I’m not even sure any of it’s worth complaining about. Really, I just want more Raddus, I want to see Ackbar and Tarkin square off, and I want to see who this Jedi is. If the arc can deliver on those points, I think I can forgive any minor storytelling mistakes. The artwork is also interesting as I’m so used to seeing Salvador Larroca, it’s nice to see someone else for a change. That said, Giuseppe isn’t perfect. Hi Obi-Wan looks a little odd, his Emperor Palpatine is still odd looking, and his Tarkin could be a bit better. The aliens, on the other hand, look good. Yet the coloring can be a bit weird. For instance, the second panel of King Lee-Char is very bright and cartoony. It’s looks like something from an animated cartoon. However, overall, it’s not that bad and it gets the job done. While my feeling are a bit mixed, I came out of this issue with a lot of interest in seeing what will come next. Did Soule throw in some cheap shots to get people excited? Sure. But fan service or not, I didn’t enjoy it and, so help me, I’d like more of it. Thus I give this one a four out of five metal bikinis. More Raddus, please.